Pizza has become a staple of the Western diet. From deep-dish, Chicago style pies covered in meats and cheeses, to the lightly seasoned traditional recipes of remote Italian villages, the pizza is a method of self-expression and culinary delight. The traditional method to making a pizza involves large brick ovens, acrobatic crust making, and the wisdom of the masters. Today, in our home kitchens, we are able to replicate the classic recipe with the right tools and recipes. Having the right pizza stone is key to creating those crispy crusts and gooey toppings we all love. But before we go any deeper with our analysis you may be interested in our top choices below. We will be sharing with you the two different types of pizza stones, thermal shock resistant and non-resistant models, to give you all the information you need to purchase a pizza stone that fits your needs. We will begin with the more expensive, shock resistant models for the pizza enthusiasts and then discuss the casual usage, non-resistant models. Once you’ve made your choice on which model is perfect for you, be sure to check out our collection of pizza stone recipes to learn how to go beyond pizza and cook up some delicious surprises with your new product. Before we get into which thermal shock resistant pizza stones are best for your needs, let’s unpack why thermal shock happens and why it matters. When an ice-cold pizza is set onto a stone and put into a preheated oven, the extreme temperature changes can cause the stone to crack. Sometimes, this will happen right away but it can also weaken the stone and crack at a later time. Obviously, this is a valid safety concern for anything of this weight and potential temperature level. Purchasing a thermal shock resistant pizza stone ensures you never have to worry about the dangers cracking. The best option to avoid breakage is to purchase a stone specifically marked as thermal shock resistant. Let’s take a look at our top 3 recommendations for shock resistant pizza stones. This pizza stone is one of the best options out there for shock resistant technology and an overall great product. The black ceramic of the stone means no unsightly stains that linger on the lighter stone varieties. In fact, this pizza stone boasts a like new appearance after each use and wash. This is a major crowd pleaser if you’re ready to move past the unavoidable stains and odors of the light stones and embrace the shock resistant technology. At 15-inches, the Heritage pizza stone is an idea size for the average family’s pizza needs. Personal pan pizzas can always fit onto a larger stone for smaller groups or individuals. The Round design means it takes up only the necessary amount of space in your over or in storage. The slim design also allows the Heritage stone a pre-heating time 50% faster than its competitors. This means your pizza is ready quicker and with more energy efficiency, adding value to the product. Beyond pizza making, this stone is also compatible with grilling and BBQ cooking methods. It can be used indoors or outdoors thanks to its durable design and lifetime guarantee. It’s rated at the top choice for pizza stones on Amazon and comes with such rave reviews; they have you craving pizza more than ever. With the added bonus of a free pizza cutter included with purchase, you’ll be ready to turn out your favorite pizza recipes the moment it arrives. The price is one of the lowest on our list, but this is still considered one of the best options available. 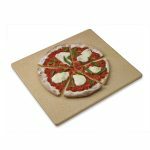 The design is clean, efficient, and durable for serving up quality pizzas over the years. 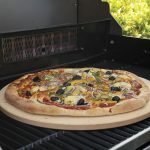 With its versatile abilities in the oven, grill, and BBQ the opportunities are endless with this top rated pizza stone. The Pizzacraft pizza and baking stone is the cheapest option in the shock resistant category. It’s the perfect buy for pizza lovers looking to stay under budget, but still concerned with the safety of their pizza stone. The cordierite stone is ideal for making crispy crusts without any seasoning or flavoring required. The mineral keeps the stone from shattering at extreme temperatures and gives the stone its classic look. It is big enough to accommodate the needs of the average family and its slim design makes for easy storage when not in use. The light, stoneware appearance will become darker and stained with continued use. Due to its porous surface, the stone cannot be submerged in water or cleaned with soap. This is why it is more susceptible to stains than the black ceramic Heritage model. This normal for light colored pizza stones, but might be a drawback for the chefs with a bit of a perfectionist side. While the thermal shock resistant qualities make this a great pizza stone for reheating frozen pizzas, it has many possible uses. The round design is perfect for making pizzas, bread loaves, or multiple pastries. It can be used in the oven or grill to prepare anything from calzones to cookies. This makes it a solid choice for the budget chef looking to get longevity as well as durability from their pizza stone. Weighing only 8.8 pounds, this stone is easy to transport and can be easily carried from grill to table. The safety features and value make this a top pick for best pizza stones on the market. The cordierite stone is sometimes the preference of chefs looking for safe, thermal shock resistant stoneware. The natural mineral leaves no taste or odor in the stone, giving a clean bake with consistent flavor. We recommend this pizza stone for anyone looking for a safe, classic way to bake pizzas and more with ease. The final thermal shock resistant pizza stone is the most expensive model we’ve reviewed, but delivers in all the right areas. This Old Stone model is excellent at creating light, multilayered crusts for pizza artisans with a love for making quality meals. The price is reasonable for the added safety bonus and durable design. If you’re thinking about spending a bit more for a quality option, the Old Stone model is an ideal choice. Different from the above models, the Old Stone’s rectangular work surface offers a few new options. Square shaped pizzas, extended baking space, and upright storage are all possible thanks to the rectangle shape of the stone surface. If you’re planning to use your stone for more than pizza, this rectangular option is a major plus. It can serve multiple functions for baking a full dozen cookies, bread loaves, and more thanks to the added space. This model is a bit more expensive, in part, because it is handmade in the US from all US sourced materials. This is especially important if you are interested in shopping local from trusted companies that use quality ingredients. They advertise their special heat core technology as a testament to quality ingredients that produce crisp, even crusts without soggy centers. The pizza stone weighs a solid 10 pounds and is made of pure stoneware. This means it’s a bit heavier than the above options and has the classic light stone appearance. That light stone look means that after multiple uses, stains are normal. The porous stoneware holds in the oils that meet its surface creating the typical discolorations. Aside from this detail, the stone is a classic choice that allows for versatility in the kitchen and quality bakes. It’s a great choice if you’re looking for a safe, classic way to make pizzas and other bread items at home with a quality product. The other options when it comes to buying quality pizza stones are the ones without thermal shock protection. While we recommend the thermal shock resistant models first, the non-resistant models can deliver pizzas just as delicious with the proper care and precautions. If you are not planning on using frozen pizzas, or are unbothered by taking time to regulate the temperature when using the pizza stone, thermal shock doesn’t have to be a key issue. Chefs with the patience to follow instructions and avoid extreme temperature changes will have no trouble adjusting to a pizza stone without thermal shock protection. If you are looking for a product that will deliver fast results from frozen pizzas, thermal shock protection is encouraged. But if you’re willing to take the time to treat it right, you can absolutely get away with a non-resistant pizza stone for frequent use. These three options will show you our favorite picks for non-resistant pizza stones that will help you create delicious meals again and again. Our first option is a classic pizza stone model from Chef Essentials. 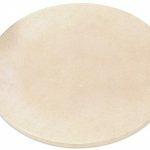 The round cordierite stone is ideal for crispy pizza crusts and baking. The key to keeping this stone working properly is easy. Simply make sure to preheat the stone in the oven before adding your favorite frozen pizza. This ensures the stone adjusts to the high temperature slowly and prevents breakage. No time is lost with this method, since you would have to wait for the oven to preheat no matter which stone type you use. It’s a small thing to remember on you way to creating amazing pizzas. The round design of this stone makes it perfect for baking up pastries and pizzas alike. It can serve many functions in your kitchen if you use it properly. As with most pizza stones, this model is not one you should use harsh abrasives or soaps on. To clean the pizza stone, it is best to use a flat scraping tool and avoid submerging it in water. The stone is sure to gather some stains through normal usage. However, these discolorations are expected and should not change the effectiveness of the product. You can avoid left over odors and flavors by keeping the stone away from cleaning solutions, water, and excessive oil. If the proper care is maintained, this pizza stone is an excellent choice for creating delicious recipes. It’s a crowd favorite for its consistent delivery of crisp crusts, bread bowls, pastries, and more. If you’re looking for a pizza stone to try out your skills with, this model is a durable place to start for beginning pizza chefs. Since this pizza stone doesn’t require any additional seasoning or conditioning, it will be ready to go the moment it arrives. If you’re looking to jump right into the art of pizza making, this baking stone is the right place to start. 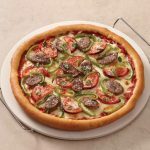 This round ceramic model from Wilton is a light, efficient pizza stone with a carrying and serving rack included in your order. The stone itself only weighs a little over 5 pounds, but with the convenient chrome plated rack it is even easier to move this stone from oven to table. This makes it an ideal choice for making specialty pizzas at home the whole family can enjoy hot from the oven. This stone is known for its ability to retain heat and keep your baked items warm long after they’ve left the oven. This means you can carry your pizza out to the patio for an outdoor meal and know that it will be kept warm and ready to eat. The carrying rack ensures you won’t burn yourself on the hot stone surface during transit. Of course, being non-resistant to thermal shock, this stone does come with some specialty instructions. The ideal way to keep your stone in top condition is to insert it in the oven before you begin the preheat process. To avoid breakage, you should never put a cold or room temperature pizza stone into a hot oven. As with other baking stones, the Wilton model is versatile. 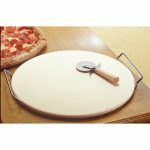 You can bake cookies, scones, breads, or even warm up your frozen dinners with the help of this pizza stone. Its round design is fairly slim and easy to store laying flat in your cupboard or drawer. Discoloration is normal with this type of light colored stone. The best way to clean it is with a flat scraper or a slightly damp cloth. This should prevent any additional discoloration and keep it in top-notch condition. It will be a fixture of your home and kitchen for years to come with the proper care. Our final selection is a slightly smaller model from Good Cook. This is the perfect budget option for the occasional pizza enthusiast or the college student off to live in dorm life. It has a traditional round design with a natural stone body. At less than five pounds, it’s a light and efficient way to whip up a quick and delicious crust or baked good. The stone is designed to heat evenly to ensure you don’t have any hot spots that cause burnt or raw dough. Its slim surface retains heat as well, keeping whatever you bake warm and ready to serve. The included rack works to protect you from the heat locked within the stone after use. It also makes it easy to serve a hot and delicious pizza directly from the oven to the table. This is definitely the bargain stone on our list and does not offer thermal shock resistance. If you’re hoping to use your new pizza stone frequently, we would suggest going for a more resistant, hardy model. However, if you are just starting out or only plan to use the stone every once in a while, this is a great buy for a natural stone. We encourage buyers to follow the directions exactly when it comes to heat and water exposure of this stone. The main rule is to preheat the stone properly to ensure it is not subjected to extreme temperature changes. If you can respect this rule then the stone is sure to turn out delicious breads, cookies, and crusts with every use. Does a Pizza Stone Really Make a Difference? If this is your first pizza stone buying experience, you may be wondering why you need a specialized item in the first place. If your oven rack has served you well in the past, it might seem silly to drop 20 to 30 dollars on a pizza stone that takes up cupboard space. However, the difference it makes in your pizza crusts and breads is worthy of notice. Pizza and baking stones allow for crisp crusts and authentic bakes. There’s a reason the first pizzas were always made in brick ovens on large stone slabs, there is no comparison to a stone baked crust. If you want to upgrade your at-home pizza experience from ordinary to extraordinary, a pizza stone is a must have. Plus, thanks to its adaptable nature, you can use it to make anything from fish sticks to flatbreads with ease. Don’t forget after you make your purchase to check out our recipe collection. We have an entire collection of pizza stone specific recipes you can try out on whichever stone you choose. Luke is the hand moving the type writer, but don't be fooled, the opinions he shares are his as much as they are Linda's. We are cooking enthusiasts and Luke is also a tech enthusiast so we have every cooking machine you can think of from an air fryer to a bread machine, even an espresso maker and a rice cooker.